According to jain religion- ‘anger is one type of violence. It is violence to oneself and towards others. An angry person opens his mouth but closes his eyes.’ Scholars believe that negative emotions are harmful for the body. Research conducted on these emotions has revealed that they cause total destruction. A context in mahabharata says that- Yaksh asked Yudhishtar as to who is the true brahman? Yudhishtar replied -“he who has love, compassion and sacrifice for the living beings”. This proves that a person, who believes in positive thinking, is the best person not only for himself, but also for the family and society.He understands the importance of life. Anger is a negative emotion, which reveals the nature and mental unheal thiness of the person. People who are physically and mentally healthy, they seldom get angry. Anger drains out the accumulated energy in the body. Why do people get angry? probably this question puzzles each one of us. anger arises due to fear. When a person gets angry either knowingly or unknowingly, he develops some kind of worry and fear in his mind. a suitable example will further clarify the actual meaning of anger. When sikandar (alexander) invaded india, he saw a devoted sage on the banks of sindhu river. Sikandar promised many materialistic gains and wanted to take him along with him. The sage refused all the things he offered. Sikandar lost his temper and lifted his sword to kill the sage. To his surprise, the sage did not feel afraid. The sage replied politely,’ you can destroy my body, but not the soul, which is unborn, unlimited, unbeatable and immortal.” The sage was absolutely fearless, that is the reason he could speak so much. company of good people and worshipping the god is necessary to become brave. Worship gives strength, because strength of the soul is the greatest strength. when a person worships, he associates himself with the supreme god, who manages the entire universe. Company of good people cleans the blood veins, nervous system, heart and brain. it is not necessary that every dacoit becomes valmiki, but the influence of good company cannot be underestimated. 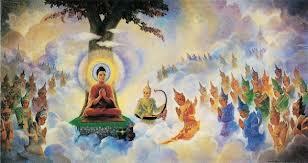 Once gautam budha went for alms, a lady asked him, ‘what is the influence of good company’? Gautam budha replied, “tomorrow you prepare a bucket of kheer for me then i will give you the correct answer”. Next day, gautam budha went to the lady with a cup of cow dung and asked for alms. He asked the lady to pour the kheer in the cup. In the beginning the kheer started coming out of the cup but slowly the kheer started throwing out the cow dung out of the cup. Gautam budha said, “this is the influence of good company”. Yogic activities are necessary to win anger. Regular practice of these exercises makes the person positive minded. Irritation, sleepless ness, unnecessary worries and other negative emotions do not trouble the person. He develops the habit of forgiving others. forgiving nature and tolerance are the two important sources of successful life. One should try and lead a life like the selfless tree, however this is not very easy. Worship and company of good people is necessary to develop these habits.